Is Horse Racing Really Aware Of Daily Fantasy Sports? After starting to look into Daily Fantasy Sports the past year and now playing it somewhat regularly the past month and a half, I'm starting to feel that potentially there could be an unprecedented decline in horse racing in the very near future that would make the recent 3% decline in yearly handle look like a lottery win. It is bad enough that handle keeps falling, even a red cent, from year to year, when you take into account that the majority of people in North America can now bet on the majority of tracks at any time from the convenience of their own home, 7 days a week, 18 hours a day (though many need multiple online accounts to get their best bang for the buck and full content). Lets not forget about factoring in inflation and population increases when putting horse racing's numbers in perspective. Nor should we forget about the online poker ban either. Something is very wrong, and hint: it has nothing to do with lack of technology or people not exposed enough to the majesty of the horse. Nope, it stems from realizing who the customer is, who the potential customer is, and most importantly, catering to what the customer wants. Who is the customer? The customer is the Horseplayer, it always has been. Today's Horseplayer is a dying breed, as most were brought into the game back when it was a monopoly and at that time, the only way to gamble was to physically be at track. Those days are long gone, but instead of addressing the real problem, many in the industry believe they can grow racing by getting or forcing (see Texas) people to go to the track on regular basis. The reality is, that going forward, this line of thinking is as inane as the idea of starting a company that makes rotary phones. We're in a technological age and an age where other forms of gambling, from casino to fantasy sports to lotteries and other forms of at-home entertainment are growing, and not going away (the NBA recently embraced Daily Fantasy Sports). Going to the track on a regular or semi-regular basis makes no sense anymore for almost everyone, especially potential new gamblers. Who is the potential customer? These are the people who day-trade, who play daily fantasy sports, poker, blackjack (not slots or lottery players)...people who like to make decisions based on information and gut, looking for value in game that at least has a few perceived winners. They are not stupid. Not even the potential new dummy money is as stupid to try to learn a thinking persons game that has zero perceived long term upside. Gamblers also crave action, but their bankroll can't be depleted too fast or many wake up in a hurry and find something else to do. It is pretty nervy to ask a gambler to keep going to the well for significant dollar amounts in order to stay in a game that takes brains when there is no long term reason to. Until the price (takeout) is lowered enough to allow for long term winners to be visible (sans rebate), horse racing has a zero shot of attracting enough newbies to make up for the old-timers who have stopped breathing and now are unable to bet, or have had enough of losing too quickly. What does the customer wants? You need a game that is perceived to be beatable in the long run by at least a few, and you need a game where a bankroll has a chance to last. 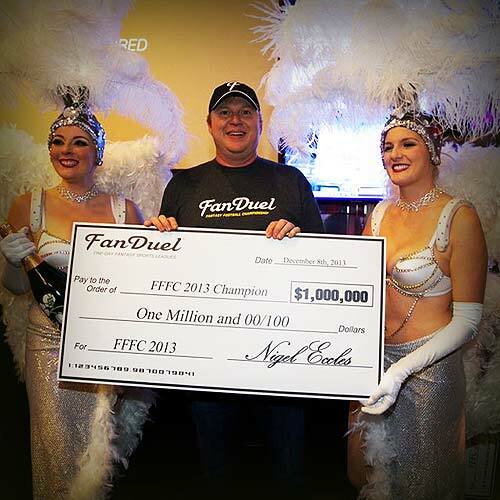 Enter Daily Fantasy Sports. Takeout is less than 10%. The more one plays, the more efficient one gets. The learning curve to be good can be surprisingly high, but not very expensive, as one can get a night's worth of action for the cost of a lottery ticket. Right now, it is pretty much a gimme that there are consistent winners (this might not be the case a couple of years from now, but if handle starts to dwindle, I have a feeling they might lower takeout, not increase it, making the game beatable by at least a few again). Since I started dabbling, I've found that I'm getting better at it, and my handle has increased (still, nowhere near my horse racing handle in times when I believed the game to be beatable), but more importantly, I'm finding the fix I get from handicapping horses presently is identical to the fix I get from handicapping a basketball lineup. The rush I get from watching a game in action while monitoring the scoring in other games is similar to the rush I get from a card of horse racing. And the bang for my buck seems astronomically better when it comes to Fantasy Sports than it does from horse racing these days. Oh, and mounds and mounds of information needed to make well educated guesses is free free free. The rushes I speak of might also have to do with knowing the game is possibly beatable so I'm not handicapping and watching for nothing. Optimistically to me, this proves how good things could be if horse racing were to adopt takeouts in the range of 8-12% and past performance info outside of maybe premium info was free. I still believe strongly that horse racing is best thinking person's game out there, and has the greatest potential (big reason is you can paid in race that takes two minutes versus a game that takes upwards of 5 hours to complete), but it is priced too high, especially since the dummies have left the building, and that has contributed greatly to the lack of long term winners. Currently, lower takeout seems like an impossible dream, especially with Churchill Downs Inc. and the Stronach Group wagging the dog. For lower takeout to work, all tracks are needed to be on board with today's "I just cashed, what track is going off next" internet/simulcast gambler. In other words, horse racing may need to blow itself up and start over again in order to grow....I think it will inevitably happen, but I may not live to see it. Another important point is that I don't think too many Daily Fantasy Sports players understand the ramifications or even care about the takeout, but they understand how much is in their account to churn......just like most Horseplayers. Yet one game with a 21% average takeout is on the decline, and the other is growing exponentially. I also don't think DFS has explored optimal takeout yet as it is still in uncharted waters, but by the time the dust clears, it will, and I wouldn't be surprised to see takeout rates drop a bit in the near future, especially if there is even a sign of bottom line decline.